All I did was add a link. The link I added was the problem. But it was just a link, what could possibly be wrong? Well, unescaped characters were the problem. Say what? The link ended like this: ?langId=-1&storeId=10057&catalogId=10001. In HTML the ampersands (&), which represent spaces, have to be replaced with &amp; or they won’t validate. Trouble is, when I wrote the ampersands as escaped characters the link wouldn’t work. NOW what! This is where TinyURL comes in handy. 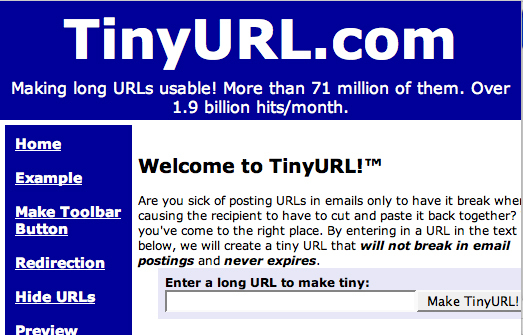 You can find TinyURL at a tiny URL: http://tinyurl.com/. Simply paste the URL you want to make tiny into the “Enter a long URL to make tiny:” data entry field. Hit enter and a tiny URL is created. Simply copy the tiny URL and paste it into your HTML. With no unescaped characters the page passes W3C validation. Thanks TinyURL! Next PostNext David A. Paterson, New York Governor, Accessibilista?